Tampa Bay Buccaneers running back Doug Martin will be suspended for the first three games of the season and now general manager Jason Licht told ESPN that the starting job might not be there for him upon return. 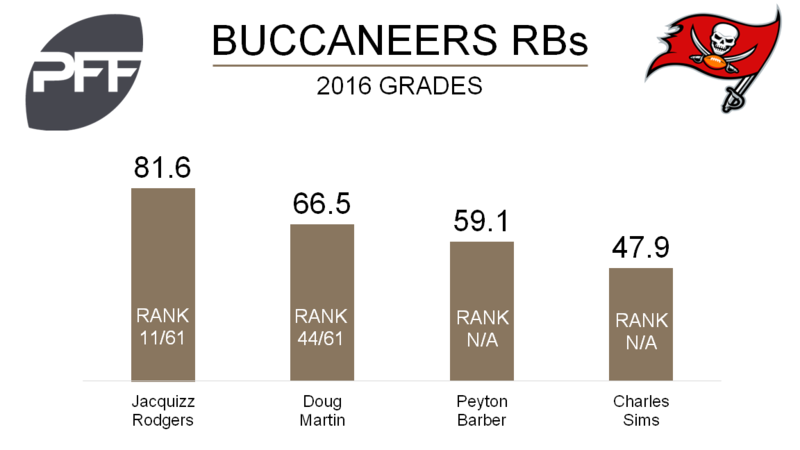 Coming off a 2015 where his PFF grade of 88.2 ranked third among running backs, Martin’s 2016 grade of 66.5 ranked 44th at the position. Part of this could be attributed to Martin’s decrease in yards after contact per carry. In 2015 he averaged 3.1 yards after contact per attempt, but that figure dropped to 2.5 in 2016. For the first three games, the Buccaneers are figured to use a committee approach led by Jacquizz Rodgers, whose PFF grade of 81.6 was 11th among running backs this past season. It was also noted by Pewter Report that rookie Jeremy McNichols has already been getting first team passing game reps in camp. McNichols’ 2016 grade of 86.5 ranked sixth among draft eligible running backs.